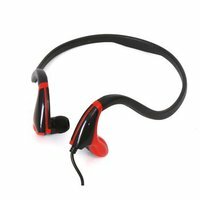 Modern design and high quality of as well as very good parameters are key features of Freestyle headphones. Comfort of use and changeable foams. They are very light which makes them a perfect fit for active persons (e.g. jogging, cycling). Long (110cm) and durable cable prevents the headphones from getting damaged while using them. Thanks to a special bass enhancing system, the sound is more clear and deep.